TAMPA, Fla. -- It started with an archeological trip in 2001 when University of South Florida Associate Professor Philip Levy and his research partner, David Muraca, traveled to Fredericksburg, Va., to learn about George Washington’s Ferry Farm, the late president’s childhood home. Working with his long-time collaborator David Muraca, director of archeology at the George Washington Foundation, the not-for-profit foundation that owns the Stafford County, Va., site, the two researched the site’s history and archaeology. During the course of 10 years, Levy has been traveling toVirginia for research and to bring USF graduate students and undergraduates with him for his annual summer class that teaches archaeology, museum studies, and Virginia history. The new book is a 300-year-old study from Washington's childhood to more recent events of local people preventing Walmart from building a shopping center on Washington’s farm in 1996. Through his research, Levy saw Ferry Farm as a thriving land instead of inadequate. He also finds Washington’s mother, Mary Washington, to have an influence in his life after his dad died when he was 11 years old. Levy said Mary instilled gentility in George and his siblings. Levy makes an emphasis on death in the book -- including the death of Washington’s younger sister named Mildred who died when he was 9 years old. She’s the only Washington buried at the farm. Levy was surprised to discover when Washington surveyed the land to leave it in 1771, he started at his sister’s grave. Another story mentioned was the death of an enslaved African. In the book, Levy recreates a scene of an enslaved African, owned by the Washingtons, named Harry, who killed a member of his community, which surprised many people in the tribe. Levy also says many of the slaves were given English names, which surprised him. Harry would eventually be arrested and executed. Centered on Washington’s childhood, Levy retells the story of Washington cutting down his father’s cherry tree and not lying about it. That story creates the setting for the book. With a backgrounds in early America studies and Chesapeake Archaeology, Levy and Muraca were excited to shift from studying the 17th century to the 18th century, but Levy began to notice most of the pictures of the farm and the stories were from the 19th and 20th centuries, which became uncomfortable for him to write about. “Trained in early America history with a very strong focus on early stuff, the idea that I’d suddenly be writing about the 20th century was very uncomfortable and it took a long time to let that settle in, but it did,” Levy said. By 2008, Levy had landed a fellowship with the National Geographic Society and they wanted to work with the George Washington Foundation to create a news event -- a national announcement of findings. That media coverage generated world wide attention. By then, literary agents had contacted him about writing a nonfiction story for a mass audience. His new book is the result of that process. 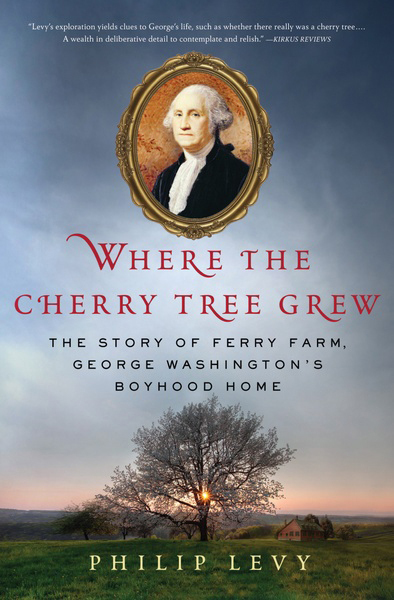 “Where the Cherry Tree Grew: The Story of Ferry Farm, George Washington’s Boyhood Home” hit bookshelves on Feb. 12. With that writing project completed, Levy is working on another book with the University of Nebraska Press, in which he asks more theoretical questions about landscape, history and memory. The George Washington Foundation is privately held, non-profit organization, headquartered in Fredericksburg, Va. Their mission is to enhance the public understanding and appreciation of the lives, values and legacies of George Washington, Fielding and Betty Washington Lewis, and their families.